Amanda has shared her experiences with Woolite Oxy Deep spray carpet stain remover. 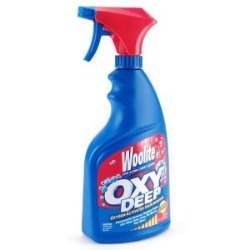 I spilled a carton of juice on the carpet and furniture in my rental apartment, so I was in a desperate hurry to get a good carpet and upholstery cleaner when I came across Woolite Oxy Deep spot and stain carpet and upholstery cleaner spray. The label said that this product is oxygen activated so I decided to buy it because I had good experiences with oxygen activated products in the past. It was a little more expensive than some of the other brands and twice the price of the generic but I knew I could trust the Woolite brand and I needed a quality product to remove the stains quickly. I sprayed the product on the juice stains and let it set for five minutes as the directions said to do. Then I gently rubbed with a cloth and noticed the stains immediately lifting from the upholstery. Woolite OxyDeep removed all traces of the juice stains from the furniture and almost all traces from the carpet. It also left behind little to no smell which I appreciated because I am not a fan of chemical smells. I would definitely recommend this product. Thanks Amanda for sharing your experiences with this Woolite product. I noticed that Woolite has several versions of carpet cleaner, each with oxygen activation. If you have used any of these cleaners, please share your review with me so we can all learn how they work. You can share your Woolite carpet cleaner review here, or read others that have already been submitted. In addition, you can share your carpet stain remover review here for any other brand, telling me how it worked for you. Join in and write your own page! It's easy to do. How? Simply click here to return to Woolite carpet cleaner. My 2 year old got a little over zealous with the crayons and took to my beige carpet with a black and light blue crayon. There were no bits of crayon on the carpet, just the long strokes of a back and forth motion of the crayon, some of which went deep in to the carpet to the backing. I looked up the crayon cleaning process on Woolite's website and followed the instructions exactly. It stated to use a dry cleaning agent like Carbona first or alcohol if dry cleaning agent not available. I opted for what I had, rubbing alcohol. I used a white rag and blotted away with the alcohol changing the rag continuously. I noticed the lightening of the crayon right away. I then sprayed Woolite Oxy Deep on the crayon marks (no saturating) and waited 5 minutes. I had to do this step with the Woolite twice and had to use a bit of elbow grease with the blotting to make sure I got down to the backing of the carpet. I changed the white rag continuously with the Woolite as well because I could see the transferring of the crayon to the rag. I then used a damp white cloth to remove any excess Woolite from the carpet and then pressed dry paper towels to pick up excess dampness. I am pretty satisfied with the results. This process removed 100% of the light blue crayon and about 98-99% of the black. I think I only notice it because I know the stains were there. Good luck and I hope this gets your crayon out too. 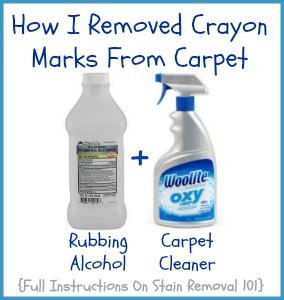 Thanks so much for sharing your method for cleaning crayon from carpet. I'm sure it will help lots of people. If anyone else has tips for removing crayon from any surface you can share them at the link, or check out the other tips already submitted. Further, I've got an entire crayon stain removal guide here you can check out as well. If you've used any Woolite product for cleaning carpets you can share your review here, or read others already submitted.